Sehr ordentliches Album, gute 5*. Listening to an entire album from them can be a little tiresome, but this is a pretty solid effort that edges out "Brothers" I think.<br><br>Up and up and up. This is quite a consistent effort, I think it slightly improves on Brothers in that regard, which had a lot of ups and downs, but the high points of Brothers were probably a little stronger than the high points here. Still overall this is a very good album. Solid album, Lonely Boy is easily the best song on here, 4.5. 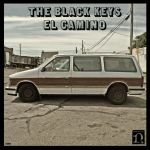 Geweldig album van The Black Keys met o.a. hun heerlijke Lonely Boy. Guter Retro-Rock der Grammy Gewinner. Nicht so gut wie erwartet habe, aber dennoch ein sehr solides Ding! Kaum ein Ausfall (Money maker find ich nicht so stark). Every track is goddam fantastic, it just keeps hitting you full force and never stops. The Black Keys are incredible, I think they are the Queen or Rolling Stones of this generation. Joah, also die Aushängeschilder von EC sind klar «Gold On The Ceiling» und «Lonely Boy». Die starke 5* für das Album wird aber auch durch Beiträge wie «Little Black Submarines» oder «Run Right Back» ins Ziel gerettet. I guess it's just not my thing. I mean I like it but not as much as most of this site (and a lot of the world) seem to. There are parts where I like the beats and the guitar but I think it's just a little bit weak especially in terms of vocal and overall catchiness. Then again this isn't pop where both of those really matter so I don't know why I keep expecting it...<br><br>The tracks I enjoyed the most were Lonely Boy, Little Black Submarines and Mind Eraser. I admit that I haven't given this album a full listen through until now, and I regret not doing so earlier as this was brilliant.<br><br>I believe that I gave every song on the album the 4* option or greater. It all just seemed to fit together very well, and every song was likable (as suggested through many of my reviews for each song being just "cool").<br><br>I'm guessing that I probably would've found this to be one of the best albums of 2011.<br><br>The absolute standouts of the album were "Lonely Boy", "Gold On The Ceiling" and "Little Black Submarines". Sehr ordentliche Platte, die zwar musikalisch nicht ganz meinen bevorzugten Genres entspricht, aber mit seinen Anleihen bei Glam-Rock und Brit-Pop durchaus überzeugen kann.